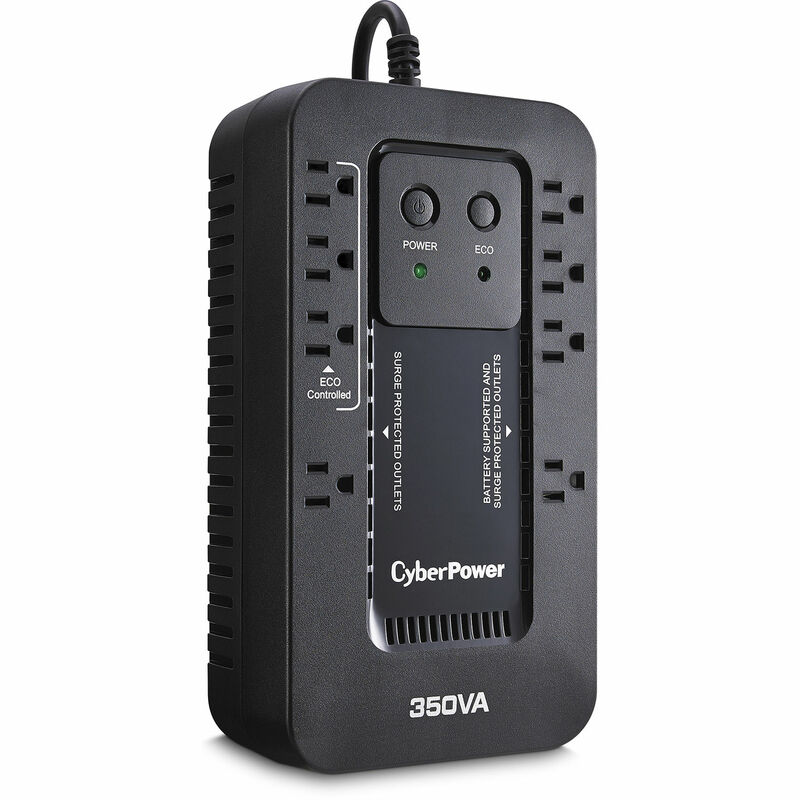 The EC350G Ecologic Series Uninterruptible Power Supply from CyberPower comes equipped with eight electrical outlets. Three of these outlets are eco controlled outlets designed to conserve energy by cutting power to USB connected peripherals when that computer is in sleep mode. This UPS also comes equipped with four battery- and surge-protected outlets and four surge-only protected outlets providing both surge protection and battery backup in the case of a power interruption. The included sealed lead-acid battery comes with a typical recharge time of 8 hours and is capable of an 11.5 minute run time at 90W and 3.3 minutes at 200W. The integrated surge protected outlets are capable of absorbing up to 526 Joules keeping your attached electrical devices safe from harmful spikes in electrical current. Also included with this UPS is CyberPower's own PowerPanel Personal Edition software. When this software is used with a compatible Windows-based PC, you can instruct the PowerPanel software to save open files, set the machine to hibernate mode, and eventually safely shut down the PC when the backup battery is depleted. The user selectable ECO mode removes power to computer peripherals connected to the ECO designated outlets when the UPS detects the computer, connected to the UPS via USB, is turned off or in sleep mode. This results in additional cost savings by eliminating the power consumption of idle devices. This ENERGY STAR qualified UPS system utilizes CyberPower's own patented GreenPower UPS High Efficiency design to reduce power consumption by increasing power efficiency to greater than 98% to save costs and reduce emissions. This uninterruptable power supply comes with reduced sound emissions. Shielding against electromagnetic interference and radio frequency signals prevents line noise ("humming") over telephone lines or audio systems. Widely-spaced outlets accommodate large transformer-based plugs without compromising the utility of other outlets. The integrated HID compliant USB port enables full integration with built-in power management and auto shutdown features of Windows, Linux and Mac OS. Compact size for mounting horizontal or vertical. LED status lights indicate Power-On and ECO on/off. CyberPower PowerPanel Personal Edition software features a user-friendly, power dashboard interface for controlling and monitoring your CyberPower UPS. Its advanced functionality includes a variety of features including runtime management, scheduled shutdowns, self testing, event logging, and more. Box Dimensions (LxWxH) 13.0 x 8.0 x 4.5"